Learn all you ever wanted to know about working with wire and types of Pliers and Tools used in Rosary Making. This information include facts about different types of Wire and Wire Thickness, or Gauge. Here you'll learn how to make your own jumprings, eyepins and "S" hooks. And how to work with memory Wire for making your first Rosary Bracelet. If you never have tried before, we hope you will also enjoy learning how to make a Wire Rosary from our instructions. Even the most experienced Rosary Maker will work with only a few of their favorite and best quality Pliers. But above we show some examples of styles one may choose to have just the right tool handy for any Rosary Making Project. You'll find Rosary Pliers your most valuable tool, as they include a built-in cutter which will easily slice through links of chain, or nip off ends of eye pins. They will cut through your fingers also! So please be careful, and remember to keep your tools away from small children. Our Rosary Makers work with 2 types of pliers when threading beads onto eyepins: Flat Nose Pliers to grasp the end of an eye pin with one hand, Rosary Pliers to make the loop, as shown above. Some Rosary Makers prefer to use two pair of Rosary Pliers, or other Round Nose Pliers, one for each hand. And yet others are able to work with only Rosary Pliers in their work hand, manipulating the other end of the eye pin with their fingers. Our Instructions for making Rosaries will always illustrate working with two pair of pliers. 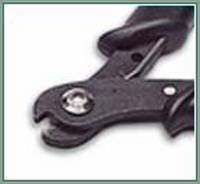 We use Wire Cutters and Side or Flush Cutter Pliers for other wire working. Our rosary makers use Copper and color coated Copper wire, 22 gauge. These wires are stable and non-tarnishing. But nickel-silver and brass wires are also easy to work with. Look for "non-tarnishing" label on other wires when you make your purchase. Available by the foot, prices range according to the material used. Wire can be made out of any type and metal. spools of copper, steel and iron wire. but not suitable for rosary making. The plating scratches easily and will off fleck off . fine silver and gold filled wires. Sterling is the strongest, hardest and easier to bend. Fine silver will not tarnish, but is very soft. With practice you will develop a "soft-touch"
by applying just the right pressure. making this the best choice for those with metal allergies. BRASS wire is an alloy made of zinc and copper. Harder than copper, it is yellow-brown in color. Brass is inexpensive, making it a good wire for learning. Use Brass (or aluminum) wire or eye pins for making Mission Rosaries. COPPER wire is the softest and least expensive wire, making it great for practicing. It is orange-brown in color and can be polished to a high shine and lacquered to reduce oxidation. Copper wire can be dyed and in a thicker gauge works well for making Rosaries. GOLD-FILL wire is made by overlaying a brass or brass-and-copper wire with a thin layer of 14k Gold. Because the brass is covered by gold, the resulting wire is tarnish resistant. It is especially important to use smooth tools when working with gold-filled wire (and parts) as the overlay can be scraped off. MEMORY wire is made of tough, permanently coiled steel. It is so strong that you have to bend it back and forth many times with pliers to break it. ( IT WILL DAMAGE ORDINARY WIRE CUTTERS. SEE BELOW.) Use it to string beads for rosary bracelets that expand to fit over the wrist. NIOBIUM wire is a strong, lightweight, hypoallergenic wire. It comes in a range of rich anodized colors. The surface mars easily and should be cleaned with a mild detergent. STERLING SILVER wire is an alloy that contains 92.5% silver and 7% copper. (or other metal) It is the most popular metal to use in wire working because it is readily available and relatively inexpensive. Because Sterling Silver wire will oxidize easily, polish occasionally with a polishing cloth. The Chart above serves only as a guide. to examine in person the different types, colors and sizes of wire before making a choice for your new Rosary. Round, half-round, rectangular, square, triangular. Buy Wire that has been "annealed" - a process that softens the Wire to keep it from snapping when bent. To soften wire yourself, heat it. To harden wire, temper it...pound it with a mallet. You will need to invest in a quality pair of Wire Cutting pliers. You may use the cutting edge of your Rosary Pliers, but in time this fine edge will wear down and become too dull for cutting chain. You may choose to use small, inexpensive wire-snips. Hold the cutters so the flat side cuts the end of the wire. This will result in a flat smooth end. Practice on inexpensive wire to see the different results depending on which side is used for the cut. If you find there is a sharp edge, this may be filed lightly with a regular emery board to remove the burrs, or you may use a bead reaming tool, or flat file. A wrapped loop, or wire-wrap Rosary instructions can be found here. When finishing a wrapped loop, gently squeeze and tuck in the cut end of the cut wire up close to the wraps. The first method is to wrap the wire around the same spot on one of the tapered ends of your round nose pliers, creating an even, cyclical spring. OR, you may use a mandrel, knitting needle or other cylinder of the same diameter as the rings you wish to make, and wind the wire tightly around it in a coil. When you have created the spring, find the cut end and snip it up through the next coil above, with sharp Wire Snip Pliers, thereby cutting off a perfect jumpring. Cut the whole spring in this way. the shape * and weakening the ring, resulting in a gapped closure. Link one to another, closing the join by gently moving one wire just past the other. This ensures that the wire will want to spring back onto the cut join and close on itself. * It is recommended that when using jumprings to form a chain, you will need to work-harden or "temper" each ring as you close it. Very small jumprings (3-4mm) may be made to add a decorative ring to your bead, as a "cap" between the bead and the eye pin. These decorative loops can be joined together with jumprings, or used alone to create an attractive chain for your rosary, or to attach your Center piece to the beads. To create each unit cut one inch lengths of wire. Using Round Nose Pliers, curl one end of the wire around the center of the circular shaft, forming a loop. curling it in the opposite direction, creating a "figure 8" shape. Jumprings may also be used to form a chain. When combined with "S" Links or "Figure 8" they make an attractive and sturdy chain for use with your rosary. to flatten. Link all units together, using jumprings in between to form a chain. Before you connect each "S" link, ensure you have closed any gaps with your Flat Nose Pliers. Many Rosary Makers prefer to make their own eye pins from wire instead of using store-bought pre-formed eyepins. A 20 or better gauge wire should work well. Thinner wire will not hold its shape, and your new rosary will, in time, fall apart. and thread your chosen bead onto the wire. of the bead, and cut this length with the wire cutter. 3. Thread the wire through the bead. to a right angle down so that it touches the bead. up the wire, gripping it tightly, and curl it into a circle, molding it around the circular shaft of the pliers. Tuck in to the hole in the bead, or at least make sure a tight closure is formed. on the other side in exactly the same way. link it to another, close and secure it tightly. Proceed along, building the 5 decades, separating the Paters from the Aves with links of chain, etc. DO NOT CUT MEMORY WIRE WITH YOUR WIRE CUTTERS. Memory wire is used for making some types of rosary bracelets. A SPECIAL TYPE OF CUTTER, called Memory Wire Shears, as shown. Memory Wire is used for making Rosary Bracelets. 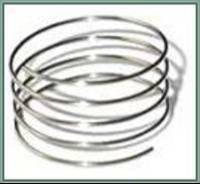 It is a thin, tempered stainless steel wire. Memory wire is pre-coiled, like a "slinky" rigid and hard to bend. It resists corrosion and will not tarnish. It returns to its original form when expanded and released. Need companion pliers for your Rosary Pliers?